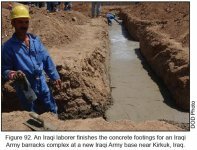 In northern Iraq in 2003, the 101st ABN placed great emphasis on the potential effects of its reconstruction efforts. Believing that the Iraqis needed a general sense of normalcy for their economy and society to begin recovery, the 101st ABN concentrated on infrastructure and schools, but also spent time opening swimming pools, restaurants, and even worked with a company to open a hotel in Mosul.57 Engineers attached to the 101st ABN taught former Iraqi soldiers basic construction skills to help them find employment. The Iraqis learned and honed their skills in the Village of Hope project that provided homes for displaced families in Mosul.58 Reconstruction projects that employed local Iraqis became a priority because of their ability to stimulate the economy. 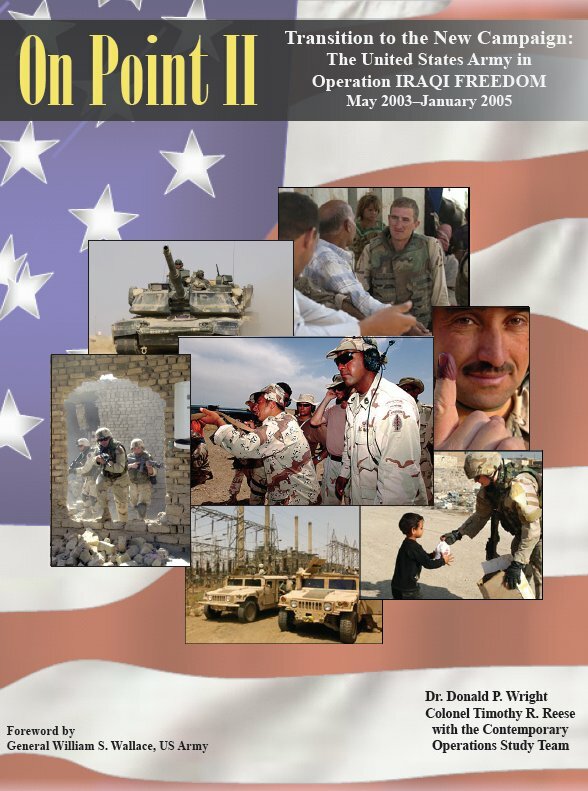 The leaders of the 1st CAV and other units that made up the OIF II rotation—those divisions and brigades that deployed to Iraq in the first half of 2004—enjoyed an advantage over the commanders of units that had deployed in 2003: the time and information required to adequately train and prepare for full spectrum operations. Once notified of the 1st CAV’s future deployment, Major General Chiarelli and his staff gathered intelligence about the AORs the division’s units would occupy and prepared for missions in those areas. In 2003 during the division’s training for OIF, Chiarelli insisted that his engineer units work with civilian planners, administrators, and engineers in the cities of Austin and Killeen, Texas, to gain a basic understanding of how cities function.66 This preparation paid off when the 1st CAV took over responsibility for the city of Baghdad. Chiarelli’s engineers immediately established an interagency effort with the US Department of State and the USAID to coordinate reconstruction projects through the University of Baghdad so that the division’s projects would benefit Iraqi contractors and the local government as much as possible. 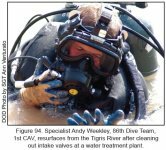 US Army units tackled a broad array of small projects in a wide variety of settings. 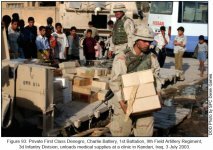 The 3d Brigade, 2d Infantry Division (2d ID), made great efforts in 2004 to bring fresh water to the people in the northwest reaches of Iraq. First Sergeant Richard Gano Jr., who served with the 1st Squadron, 14th Cavalry Regiment, recalled drilling water wells and building irrigation lines for the people of Tall Afar.76 Units throughout the brigade’s AOR worked on small projects, such as individual wells, and on larger projects in coordination with the Army Corps of Engineers and the Iraqi Reconstruction Management Office (IRMO), the US Embassy agency that after June 2004 directed the overall reconstruction effort in Iraq. Other units focused on humanitarian efforts designed to relieve suffering. In Baghdad in 2004, Soldiers of the 2d BCT, 10th Mountain Division conducted Operation WINDY CITY to distribute fleece blankets to an impoverished sector of Baghdad that had historically been ignored by the Saddam regime.77 Projects such as these were small compared to the programs focused on infrastructure improvements, but helped meet the immediate needs of Iraqi citizens and allowed Soldiers to engender good will and support for their missions. 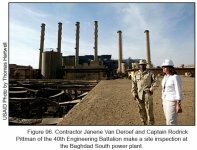 By the middle of 2004 all of these efforts had made a large impact on the physical infrastructure of Iraq. One estimate completed by the CJTF-7 staff asserted that between June 2003 and May 2004, the Soldiers, Sailors, Marines, and Airmen of the joint task force refurbished and opened 240 hospitals; 2,200 health clinics; and 2,300 schools, technical institutes, and universities.78 They cleared more than 15,000 kilometers of clogged canals and completed numerous water distribution improvements. Overall, CJTF-7 forces conducted roughly 13,000 reconstruction missions worth over $8 billion. All of the US Army’s projects, large and small, demonstrated the Coalition’s resolve to improve the lives of Iraqis.